This newly renovated fully private studio apartment is annexed to a large estate home and it s cozy modern feel will make you feel right at home from the minute you . Alta Vista Studio One greets you with a warm and playful powder blue decor that instantly relaxes you, a private en suite bathroom and a modern bedroom with a queen bed will ensure a good night s sleep. You can also relax on the futon sofa and watch your favorite TV shows on our HDTV smart TV. Like a hotel suite, we ve skipped the stove (you re on vacation after all ;) but your Studio has a lovely kitchenette equipped with a hotel size mini fridge, microwave, toaster and of course a coffee pot to enjoy a fresh cup of joe each morning to start your day in paradise. A dining table for two is available to enjoy meals or get some work done on your laptop, but don t work too hard because you ll miss the beautiful pool on property, the outdoor seating that s exclusive to your unit, or enjoy a game of tennis on our full sized tennis court. 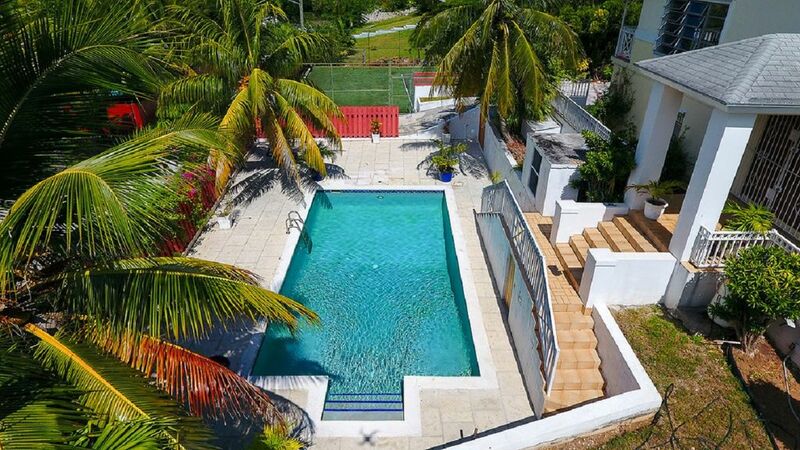 Studio One is on a large estate and when you walk the north side of the property you will fall in love with the ocean views, fruit trees in our multilevel garden and court yard. Snuggle up with a good book under the shade of one of our tropical fruit trees and just R.E.L.A.X! You have access to your private parking area and separate entrance to the property. Nearby you can also catch a public bus within a 4 minute walk, or walk down to Montagu Beach in 12 minutes and visit the nearby restaurants, or continue to the harbor bay shopping center (4 minute drive, 20 minute walk) and enjoy even more restaurants, access local banks, or go grocery shopping at Solomon s Fresh market. The Atlantis and Paradise Island is another few minutes away by car, though many people walk there from the Harbor Bay shopping center. We are 35 minutes away from the airport, 10 minutes to Atlantis, 12 minutes to downtown and 18 minutes to Cable Beach. Alta Vista Studio One is a new addition to our Tangerine Sunsets list of properties and sure to be a crowd favorite, we look forward to hosting you. Our home is near the beach. Excellent service - I recommend Tangerine Sunset a hundred percent. They are very available and their service is perfect. We enjoyed our vacations better if we booked somewhere else. The place we stayed were very clean and useful for everything. I’m thankful for all they did for us. I’m sure to be a faithful guest for them from now ! Very nice! Comfortable and quite. Great being able to use the pool! Very relaxing and quiet secluded area.
" This place is exactly how it looks clean, inviting and quiet. Pool was always clean and the response time was almost immediately. " It was our pleasure to host you. We're glad our property met your expectations and you enjoyed your stay as this is always our #1 goal. Our team is always happy to help and quick to respond. Thanks for your kind review and we look forward to hosting you again. "Alles super. Duran war jederzeit erreichbar und sehr hilfsbereit. Die Unterkunft ist genau so wie auf den Bildern und war blitzsauber. Die Küche (leider ohne Herdplatte) ist etwas klein aber ausrreichend bestückt. Für zwei Personen absolut zu empfehlen. Ein Auto wäre allerdings von Vorteil." Thank you so much for your kind words and we enjoyed hosting you. We're glad you had a great time and found our Studio One property to be perfect for your needs. We look forward to seeing you again. Vielen Dank für Ihre freundlichen Worte und wir haben es sehr genossen, Sie zu empfangen. Wir sind froh, dass Sie eine großartige Zeit hatten und unser Studio One-Objekt als perfekt für Ihre Bedürfnisse erachtet hat. Wir freuen uns auf ein Wiedersehen.